The building of the Louvre Palace is one of the longest and most complex in the history of European architecture. The Louvre was originally a fortress built in the 12th century, which later became a royal residence and was expanded and embellished over the next two centuries. The transformation into a renaissance palace began during the reign of Francis I, who in 1527 had ordered the demolition of the round keep within the square quadrangle. 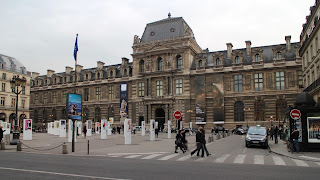 It took another twenty years, however, before the king returned his attention to the Louvre and hired Pierre Lescot to replace the medieval building. The first section of the new courtyard palace was built in 1547-51, by which time the crown passed to Henry II. The courtyard has since quadrupled in size and several of the facades have been altered, but the original Lescot wing has survived mostly intact. The relief work is mostly attributed to Jean Goujon, though the statues in the niches are from the 19th century. Lescot clearly modelled his facade on the courtyards of Italian palaces, though the result is both more ornate and complex. The projections introduce a vertical element to the composition, which is absent in most Italian examples. Arranging the facade in this way would later become typical of French architecture, but doesn't seem to have been the original intention. Lescot was following the French tradition of creating a projection in the facade to accommodate the staircase. He wanted to place it in the centre but this became difficult when the king insisted on having a reception hall across the entire ground floor. The ramp of the staircase was therefore pushed to one side, but Lescot still kept the central frontispiece of the original design and introduced a third for the sake of symmetry. The idea of having a ground-floor arcade with recessed windows may have come from the project to build a new city hall, which began in 1533. The roof is the first known mansard, which would also become a staple of French classical architecture. The break in angle of the sloping roof was probably used to diminish its visual impact. Work began on a second wing in 1553. This was to be known as the Queens' wing and was intended primarily as living quarters for a future queen and the queen mother, who had been widowed when Henry II died in a jousting accident in 1559. Its now more commonly referred to as the Charles IX wing. The decoration had not been completed when Lescot died in 1579 and the attic floor was removed in the 19th century. Lescot also built a tower-like pavilion (Pavillon du Roi) at the corner of the two wings but this has not survived. The queen mother, Catherine de Medici, ruled France to varying degrees during the reigns of her three sons: Francis II, Charles IX and Henri III. She apparently didn’t like the still half-medieval Louvre very much and chose instead to build an entirely new palace to the west, outside the city walls. Construction on the Tuileries palace began in 1564 to designs by the architect Philibert de l’Orme, while work on the Queens' wing at the Louvre came to a halt the year after and would only be completed during the reign of Henri IV. Nevertheless, work at the Louvre did not stop completely and the idea of a long gallery to link the Louvre with the Tuileries appears to have originated during this time. The first step in this plan was the little gallery. A little bridge-like structure, which spanned across the moat, connected it to one corner of the Louvre courtyard. The ground floor design appears to be from 1566-67, but the first floor was only completed by Henry IV and its design was probably only finalised during his reign. The original architect is not known but could have been Philibert de l’Orme or Pierre Lescot, who after all was still the architect in charge of the Louvre. The gallery was rebuilt after a fire in 1661 to a revised design by Louis le Vau but some elements of the original was restored by Felix Duban in the mid-19th century. The little gallery was initially built as a ground-storey terrace overlooking the Louvre gardens. The use of black marble strips on the Doric pilasters suggests some influence from de l'Orme's design of the Tuileries palace, though the result is more conventional. The decoration of the frieze may also point to de l'Orme in adhering to a 'correct' formula for the Doric order, though the decoration in the spandrels of the arches has been seen as indicative of Lescot's style. The absence of pilasters in some of the bays on the ground floor is due to le Vau's rebuilding in the 17th century, while the dormers and the frontispiece is the result of 19th-century restoration. Meanwhile, Jean Bullant took over as architect of the Tuileries when de l’Orme died in 1570. Catherine de Medici soon lost interest and work ground to a halt after 1572, though plans to expand the palace were made. Things really started to pick up with the end of the religious wars and the ascension of Henry IV. 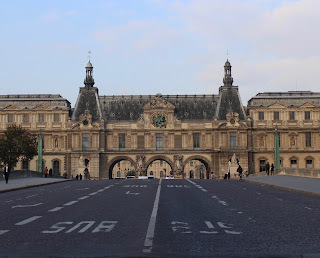 The Queens' wing was finally completed, the first floor of the little gallery was built in 1594-96 and the 400-metre grand gallery between the Louvre and the Tuileries was achieved by 1606. The job of designing the grand gallery was given to two architects, resulting in two different designs. The first section has been attributed to Louis Métezeau, who designed a two-storey building with a mezzanine between the ground and first floors. The composition feature alternating triangular and segmental pediments, except over the main entrance, where a more elaborate frontispiece is introduced. Paired columns and a balcony also adds emphasis to this part of the facade, which has been named Porte Barbet de Jouy after a 19th-century curator. Certain changes have been made to Métezeau's original design. The three-storey pavilion at one end, adjoining the little gallery, was built by Louis le Vau in the 17th century. A corresponding pavilion at the other end was later added for symmetry. Most of the statues and the ornament in the pediments and central frontispiece is due to a mid-19th century restoration effort. The rest of the grand gallery was originally designed by Jacques Androuet du Cerceau, but his work was demolished in the 1860s. The earlier facade consisted of colossal pilasters, which can still be seen in copy on the Rivoli wing built under Napoleon I, while the new river facade is closer to Métezeau. At the transition between the two different sections stood Pavillon Lesdiguières, which still exists though it is now incorporated into a wider composition, known as les Guichets du Carrousel. The pavilion was previously named after the lantern at the top of its cone-shaped roof. After the assassination of Henri IV, a second Medici queen became regent and royal building works shifted to the new Luxembourg Palace. It was only after Louis XIII came of age that attention returned to the Louvre. Work began in 1624, on a scheme that apparently originated with Henri IV: to quadruple the size of the Louvre courtyard. The north walls of the fortress were razed and a pavilion was built adjoining the Lescot wing. A new wing, which has since been named after its architect, Jacques Lemercier, was then built as a further extension. The Clock Pavilion (Pavillon de l’horloge) is named after a clock that was later inserted into the facade. The design of the caryatids has been attributed to Jacques Sarrazin and were executed by sculptors Guérin and De Buyster. The Lemercier wing (right) is identical to the original Lescot wing (left), except in the details of the relief work, which was mostly completed in the early 19th century. However, at least one of the motifs on the ground floor have been attributed to Gerard van Opstal and dated to 1638. Louis XIII died in 1643 and his widow, Anne of Austria, moved the royal residence across the street to a palace originally built for Louis XIII’s chief minister, Cardinal Richelieu. This building is still known as the Palais Royal. Anne of Austria was forced to flee Paris due to a revolt of aristocrats, and the Fronde, as the conflict was known, was only ended in 1653. Anne of Austria subsequently moved back to the Louvre and employed a new architect named Louis le Vau. One of his first jobs was to rebuild the little gallery after a fire in 1661, turning the first floor of that building into the Galerie d'Apollon. He also also built new sections to the north and east of the gallery; creating the vestibule Rotonde d'Apollon, Pavillon du Salon Carrée and Cour de la Reine, which is now called Cour du Sphinx. He then turned his attention to the completion of the main courtyard. The north and south wings were both built following the same lines as the earlier work by Lescot and Lemercier. Le Vau's main contribution seems to have been the river front, which he intended as a counterpoint to his work on the Collège des Quatre-Nations on the other side of the Seine. Work continued on the north wing and some progress was also made on the final east wing. Meanwhile, the Tuileries Palace had been expanded in 1659-61 and le Vau and his assistant François d'Orbay redesigned the facade there in 1664-66. But the Louvre was soon to take a new direction, which would undo much of le Vau's work. He was challenged in his role as chief architect and the work was stopped. In 1665, the Italian architect and sculptor Bernini was invited to Paris and submitted designs. But in the end, the east front was designed by a committee of three members: Louis le Vau, Claude Perrault and Charles le Brun. Le Vau died in 1670 and the east facade, known as the Colonnade, is mostly attributed to Claude Perrault, though le Vau's successor François d'Orbay may also have played a significant role. In 1964-67, the moat in front of the east front was redug and surrounded with a balustrade. It had been filled in during construction in the 17th century. The colonnade is taller and wider than the other wings, and in 1668 work started on a completely new facade for the river front to match it, even though Le Vau had completed work here as recently as 1663. Perrault apparently also produced a design for the north wing, though this was only completed at a later stage. All work on the Louvre was stopped by the end of the 1670s when Louis XIV made Versailles his permanent residence. The three new wings were all left in a state of incompletion. The new riverside facade by Perrault was just a screen that had been built in front of le Vau's previous south front and the colonnade and north wings both lacked roofs. Not much happened in the 18th century, but the east wing's courtyard facade was restored by Jacques-Germain Soufflot and Jacques-Ange Gabriel around 1756. It was the first to use a full top storey instead of an attic. This was according to the existing design by Claude Perrault, who had apparently intended to use a new order for the columns. Just as De l'Orme had done in the 16th century at the Tuileries, he named his invention the French order. Using any of the existing orders above the composite of the first floor would have been considered incorrect, according to the rules of classical architecture. Lemercier got around this problem by using caryatids, but Perrault's French order was never used and the columns that were made are Corinthian. Despite the intention to complete the courtyard, the project slowed due to a lack of funds. Much of the relief work was still to do, but the decoration of the central pediment seems to have been completed during this period, by sculptor Guillaume Coustou. Some restoration work was also done to the other wings, which were finally roofed. Some of the initial decoration on the north wing was done in 1668 by the sculptor Etienne le Hongre and his team. The architect Jacques-Germain Soufflot worked on the central passageway around a century later, but it was only in the early 19th century that Perrault's design was finally completed. The decoration of the pediment is dated to after the Bourbon restoration and was the work of a sculptor named Montpellier in 1815. Despite the efforts to complete the Louvre under Louis XV, the courtyard was still a bit of a mess by the time Napoleon came to power. It had been designated as a museum in 1793 and a collection had started to grow based on art works confiscated from the aristocracy and the church. The newly-elected emperor added to the collection by bringing art works back from his overseas campaigns and he chose the Tuileries as his power base. The first order of business was to complete the courtyard, which Napoleon's architects Charles Percier and Pierre Fontaine largely achieved in 1804-1810. Percier and Fontaine were also responsible for harmonising the facades of the courtyard. This meant that some of the attic storeys had to be removed and some of the 16th-century relief work by Jean Goujon had to be sacrificed. Some of this was used to decorate other parts of the Louvre and examples can still be found over the doors in the passageway of the east wing. It seems that all the corner pavilions and the central pavilion of the south wing were also removed during this period. Pavillon d'horloge was the only of Louvre's five towers to survive. Percier and Fontaine had also built the Arc du Carrousel in front of the Tuileries palace in 1806-08. The design is based on the Arch of Constantine in Rome and originally featured the horses of St Mark, which were returned to Venice in 1815 and replaced with a quadriga by Francois Joseph Bosio in 1828. The horses of St Mark were originally taken by the Venetians from Constantinople in 1204 and date to between the second to fourth centuries. The name carrousel first appeared in 1662 and refers to the military drills, which were staged in front of the Tuileries palace. From 1810, Percier and Fontaine turned their attention to the completion of the grand design, which was to unite the Louvre and the Tuileries into one super-palace. Whole residential areas between the palaces had to be cleared before work could start on a gallery along the new street of Rue de Rivoli. Construction lasted on and off until 1824 and stretched from the Tuileries to Pavillon Rohan, which was completed around 1816. Percier and Fontaine's facade on Cour du Carrousel is a copy of Androuet du Cerceau's original design for the west section of the grande galerie. The renaissance version was later demolished, so the facades on the opposite sides of Cour du Carrousel no longer match. The decoration in the pediments were added in 1857. Work to replace Percier and Fontaine's copy was subsequently started in the 1870s but was this was never completed. The facade on Rue de Rivoli is quite different and has a similarly austere design as the buildings on the opposite side of the street, which were also by Percier and Fontaine. The statues in the niches are all of military leaders. The first eight were installed around Pavillon de Rohan in 1854-57 and 1869. The rest followed between 1916 and 1928 and were among the last statues to be added to the Louvre's facades. Some statues were ordered as late as 1936 but were never actually used. Some work was carried out during the reigns of Louis XVIII, Charles X and Louis Philippe; but it was under Napoleon III that really ambitious plans were developed, beginning in 1852. The architect Louis Visconti worked out a plan for the completion of entire Louvre-Tuileries complex and work was continued after his death in 1853 by Hector-Martin Lefuel. Visconti's plan was to narrow the space in front of the Louvre west front, by adding three new pavilions to flank the existing pavilion that had been built in the early 17th century. This space was named Cour Napoleon and the work was completed in 1857. The Louvre west front had been completed by Lescot and Lemercier in the 16th and 17th centuries and was practically bare of any decoration. 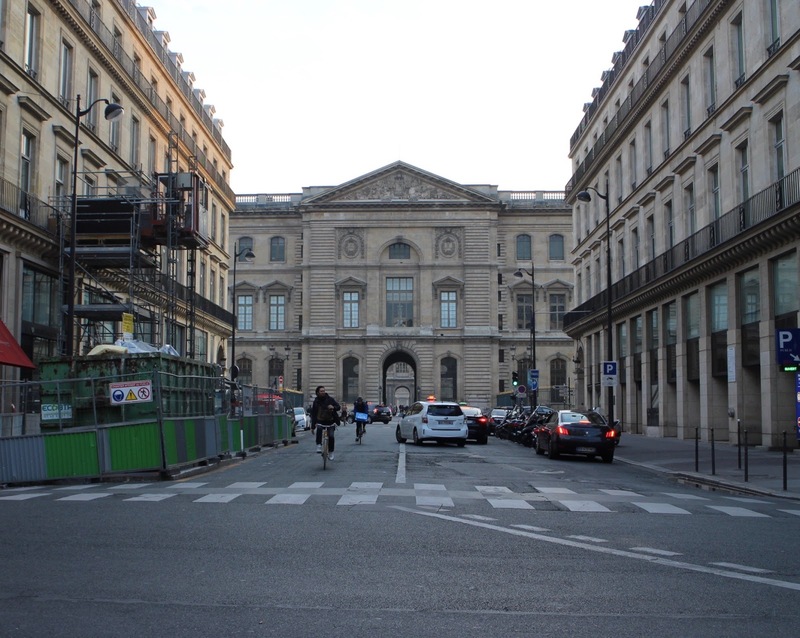 The original plan seems to have been to keep it in that vein, but Lefuel decided in 1856 that it needed to harmonise with the new facades of Cour Napoleon. The pavilion was, therefore, covered in relief in 1857. The pediment features a bust of Napoleon I, in a composition by Antoine Barye and Pierre Simart. The idea of an arcade with statues of key figures in French history seems to have originated with Fontaine and Percier. Visconti had planned for the statues to go under the arches, but Lefuel modified this by having them stand on top of the arcade instead. One of the the new pavilions can be seen on the right: Pavillon Daru. Also seen, in the corner, is the polygonal front of Galerie d'Apollon, which is the same facade le Vau had built around the time of the fire in the little gallery in 1661. A copy on the opposite side of Cour Napoleon was added by Percier and Fontaine earlier in the 19th century and is now known as the Rotonde de Beauvais. The new facades on the north and south of Cour Napoleon both have three pavilions each. Like Lemercier's original Pavillon d'horloge, the central pavilions are domed. On the north, Pavillon Richelieu is decorated with a pediment from 1857 by Francisque Duret, which depicts France as the protector of science and art. Its counterpart across the courtyard is Pavillon Denon. The other pavilions have coned roofs, much like the original corner pavilions of the Cour Carrée, which were first built by Lescot in the 16th century and copied by other architects but were eventually removed. Pavillon Turgot stands at the point where Cour Napoleon widens into Place du Carrousel. Its counterpart on the other side of the courtyard is Pavillon Mollien. Opposite the previously mentioned Pavillon Daru is Pavillon Colbert. Lefuel also added decoration to Pavillon de Rohan on the side facing Place du Carrousel. The rich decoration of the pediment depicts France seated below the imperial coat of arms, surrounded by two figures representing science and labour. The letter N and Napoleonic bees are dotted across the entire composition. The remaining section on Rue de Rivoli includes yet another pavilion, which stands opposite the facade of the Palais-Royal, where Anne of Austria held court in the mid-17th century. It is named Pavillon de la bibliothéque. The caryatids were sculpted by Astyanax Bosio, who was a nephew of the previously mentioned Francois Joseph Bosio. At this point, the whole complex was finished. But in 1861-69, work resumed. Pavillon de Flore was redesigned and much of the grand gallery was demolished and replaced. Lefuel also pierced the river facade with the Grands Guichets. The Grand Guichets were built in 1866-69. It incorporates the old Pavillon Lesdiguières (right) with a copy added for symmetry, named Pavillon La Trémoille. This meant that some of the relief work that had been completed in 1855 to harmonise with Pavillon de Rohan on the opposite side of Cour du Carrousel had to be removed. The river front originally featured an equestrian bronze statue of Napoleon III. It was removed only days after the proclamation of the third republic in 1870. The current statue, from 1877, shows Apollo riding Pegasus. The statues on either side of the central arch represent the navy and the merchant navy. Lefuel created a new facade on Cour du Carrousel in 1861-66. It consists of an attic floor, which clearly draws inspiration from the Lescot wing. The relief work explores similar mythological themes as Jean Goujon in the 16th century and the motif of Diana flanked by two dogs also shows up again. The lower parts of the facade are similar in style to the east section of the grand gallery by Louis Metezeau. The Flore wing has two entrances flanked with bronze sculptures of lions by Auguste Cain, from 1867. On the far left is a kind of turret, which marks the transition to Pavillon des Etats, which was built during the same period but is closer in style to Cour Napoleon. The Tuileries was damaged in a fire during the commune in 1871 and was later demolished. This led to the rebuilding of Pavillon Marsan and the Marsan wing in 1875-79. Lefuel proceeded to rebuild in the same style as Pavillon de Flore and the Flore wing on the opposite side of Cour du Carrousel. Lefuel would presumably have continued and built something similar to Pavillon des Etats. Instead, the facade ends abruptly at a juncture with the narrower Rohan wing, which still features Percier and Fontaine's copy of Androuet de Cerceau.